How did wolves become dogs? 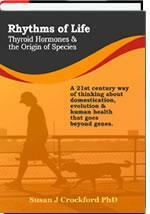 Rhythms of Life unveils, in simple language, the revolutionary new theory of how thyroid hormone drives evolutionary change (including domestication) and controls your health. It’s a refreshing scientific perspective that actually makes evolution personal. Rhythms of Life presents a compelling argument for the idea that variable thyroid function is the biological mechanism that makes evolutionary change possible. Richard Dawkins mentioned the concept briefly in The Ancestor's Tale: here is the full story on how it works. This book explains fully, but with minimal jargon, how animals could have transformed rapidly from one species to another via this mechanism, starting with wolves and dogs as examples and expanding to include familar animals such as polar bears; also included are discussions of breed development in domestic animals, the extinct flightless dodo and all of human evolution (including the newly-discovered dwarf hominid, Homo floresiensis, from Indonesia). Because variable thyroid secretion also orchestrates all of our day-to-day body functions, the concept actually makes evolution personal - providing a critical new perspective on such health concerns as obesity, cardiovascular failure, infertility, depression and birth defects, among many others. This theory is not only revolutionary but scientifically sound. It's generating considerable excitement within the scientific community...you'll soon see why.